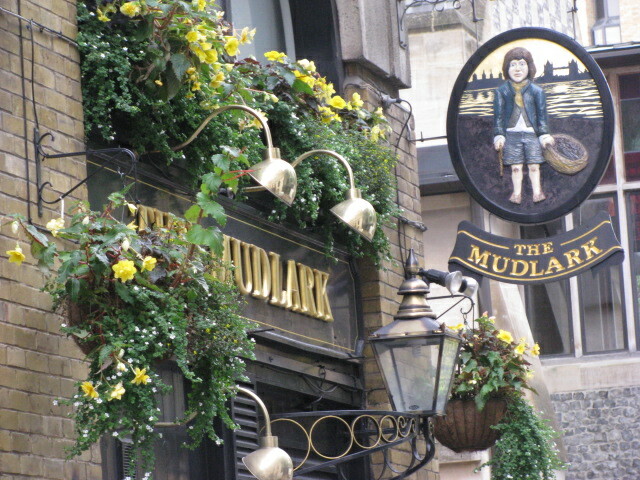 After wandering through the Borough Market in London, we stopped by The Mudlark pub. This establishment is named after those who scavenged the muddy Thames riverside for scraps of iron, coal, and other treasures that may have been left behind from passing ships. These scavengers, who were mostly poor children, started back in the 1700s. Before all the customers arrived. enjoying the atmosphere, a couple of beers, and talking. During this time, many people came and went. My one complaint about this pub was the service at the end. Up until this time, we had no issues. But when I went to the bar to pay my bill, the poor bartender was overwhelmed. We were there on a Saturday afternoon and as I mentioned it was busy the entire time. I think the rest of the staff was on break or had absconded for a few minutes. Several of us waited at the bar patiently, but some customers asked the bartender if they could grab their plates of food since they had been sitting on the counter for a few minutes and they didn’t want their lunch to get cold. I felt bad for the bartender who was trying to help everyone at once. Maybe it was just unfortunate timing and one of those rare occasions when you loathe your coworkers for making you look bad. It did make an impression though. This isn’t to say I won’t go back. I will. However, I’ll time my trips to the bar better. I give this pub 4 out of 5 stars. Maybe I should give a lower ranking, but I’m trying not to let one bad aspect taint all that was good. 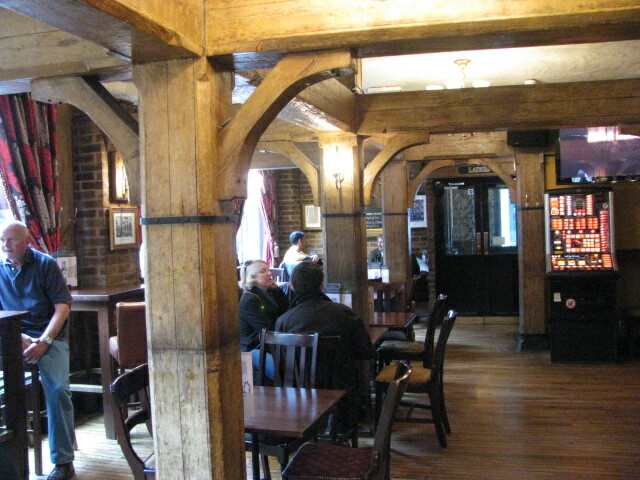 This was a lively place and I enjoyed my time. And I hope the bartender had an uneventful rest of the afternoon. Still early in the visit. Trust me, there were lots more people later. 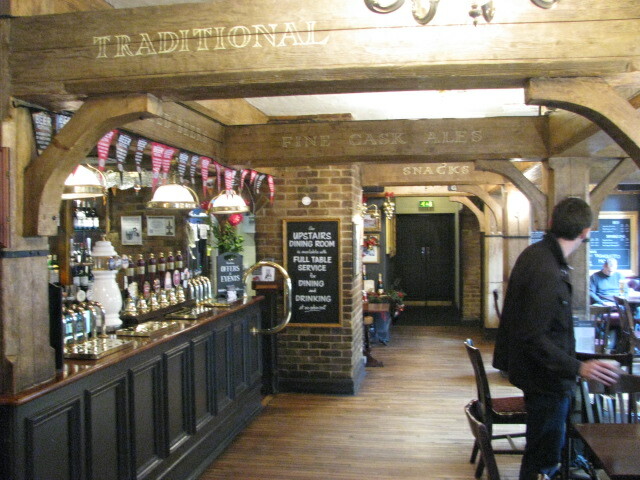 This entry was posted in Weekly Pub and tagged 50 Year Project, England, Life, London, Photography, Photos, Poor Children of London, Pubs, River Thames, Scavengers, Thames, The Mudlark, Travel, Travel Blog, Travel Journal, Travel Photos, Weekly Pub Review. Bookmark the permalink. I have been by this pub many times, but I have never been inside. Thanks for the review and the pix. Maybe it would be better to pay as you go, as you do in most pubs. That would have been better and so much easier. One of the reasons we didn’t was that the wait staff was taking our orders at the table and we were meandering up to the bar for more drinks. But I do like the ease of paying as you go. Oh well. It really was a nice spot to find. It certainly is! I think you’d love it Zelmare. Poor bartender. The origin of the pub’s name is so interesting, like something out of Dickens. It does sound like Dickens! There is so much there. I have photos but haven’t posted them yet. I had a similar problem a couple of nights ago – but this was because all the bar staff were new and so the service was very slow in our local. Doesn’t stop me going back either. I remember when I’ve trained at jobs and was super slow. It’s agonizing for both parties I think. It takes a really horrible experience for me not to go back to a pub. Not sure it’s happened yet. Do you like cider or just beer? This pub looks like it has a lot of options. I like cider and beer. it depends on my mood. I liked the options at this pub. 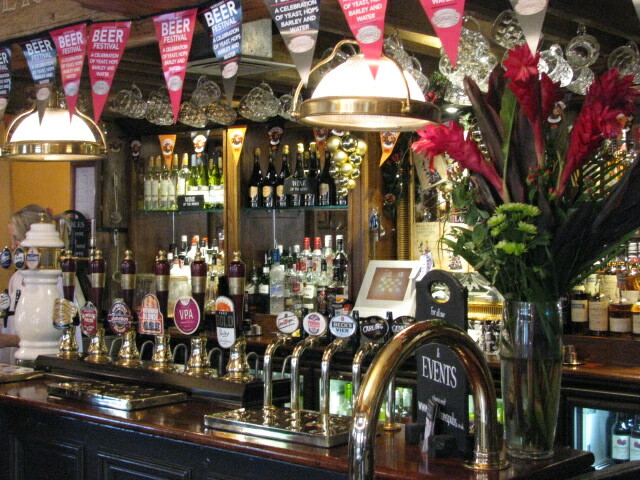 some only have a few on tap and they are the usual ones you find in London. This one had much more. I must have missed this pub – you say it’s near the Borough Market? I enjoyed the market. So many options there. You definitely have to go when you’re hungry. I think that was the first time I tasted really great cheddar. Hope you have a better experience the next time you visit this pub. It’s good you are giving it another chance. Hopefully next time, it will be adequately staffed. Poor bartender.